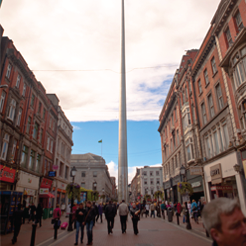 BOIPA are offering reduced card and contactless payments to DublinTown members. Since Dublin City Council exited street collection market DublinTown have been receiving complaints of businesses about problems with the collection of waste and waste bags from the street. To address this and to provide additional savings to our members we have found a way that we can make the DublinTown levy cost neutral to many members while also finding a solution to the problems of waste collection in the city centre. We believe that with business cooperation we can organise a scheme whereby members can make significant savings on waste costs while also ensuring that the city as a more efficient and organised waste collection regime. After extensive research, DublinTown have partnered with Thorntons Recycling and Aramark for the execution of this scheme. Thornton’s can also provide services for members with wheelie and storage bins, glass recycling, paper shredding and a wide array of other services. By having a single service provider for the majority of the city centre, there will be a consistency with waste removal leading to and eventually offering assurance that street waste will be appropriately disposed of and in a timely manner. Due to the scale of the project, Throntons is able to offer a considerable discount to its subscribers. Savings of up to 20%* will be seen. Thorntons is giving more control back to businesses with their waste removal. General waste can be put in any colour bag, and any size bag as long as the weight falls within the DCC bylaws (15kgs). Users may also purchase their tags easily online or by telephone and have them delivered to their shop. It’s important to note that DublinTown is arranging this group scheme for our members, the organization is not benefitting from the scheme or from businesses signing up for it apart from having a cleaner and better presented city centre. All savings as part of this offer are made by businesses alone. *Savings of 20% are based on the average cost to members as per our waste survey. As a business representative group we are acutely aware of the financial difficulties facing many of our members. As a result we are keen to introduce schemes that will save businesses money by using our combined economic muscle for the benefit of our members. In addition to the Group Waste Scheme we are eager to work with members on other group schemes and initiatives. If you would like to find out more please contact us 01 633 4680.